At PTS we strive to ensure that the proper course of action in tree care is the one that is followed. We are honest with our customers and our goal is to make sure they are satisﬁed with our work. Recommendations are important to the success of our business so we strive to do the best work for the best price. "We were recently referred to PTS by our General Contractor and the experience was excellent. Paul is professional, safe and courteous. His work was thorough and he left the area very tidy and clean. We were so impressed with the work Paul did on our project that we’ve invited him back to do more clearing and trimming on our property." "As a resident of the Kenai Peninsula Borough, I highly recommend Paulʼs Tree Service. Even with the travel fee, his accurate price quote was competitive and matched his commitment to excellent customer satisfaction. He took the time to consult with me, review my property and assess my concerns with speciﬁc trees. His good natured approach to the business transaction was refreshing and provided me with the conﬁdence that his methods were safe and incurred little impact to the other areas of my property. I would recommend him again!" "We have used Paulʼs services on numerous occasions at several properties and are completely pleased on all accounts with Paulʼs professionalism, honesty, knowledge and competitive pricing. He is easy to deal with does not oversell and practices good safety measures for himself as well as our property. We plan to hire Paul again this spring for some additional work at our residence. Over the years we have used other reputable services but ﬁnd Paulʼs superior. 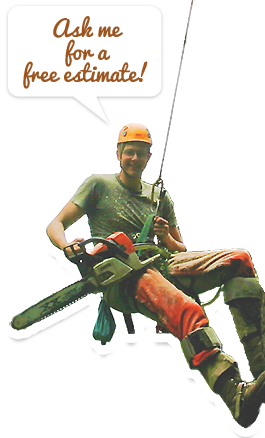 I am pleased to add this referral and I highly recommend Paulʼs Tree Service."